No, I don’t mean your husband is necessarily communicating with demons, but others are serving the enemy by trying to take over his life. Does this seem impossible? Solution # 5: To beat this tricky problem, realize that only God has the right to issue authority. He is the ultimate Authority and controls the entire universe His way. Exodus 15:18 If you can’t understand this principle, learn it soon, because it is vital to joy and peace in the Lord. How could your husband fall out of line with God’s authority, although he claims to love the Lord? Is he in crippling debt? Has he made a contract, or agreement (covenant) with the unGodly? He needs to get out, very quickly, if at all possible. The above are examples of avenues for demonic control. A Christian man is supposed to be a uniquely sovereign entity, subject only to the Lord and His delegated ones (Matthew 4:10). The enemy, unable to reach him directly, has used someone else to do the job. What can you do? Not much, unless you consider prayer the catalyst for most of the changes in God’s Kingdom. Pray with all your might that your husband will have grace to see that only God—or His delegated authorities—should stand over his shoulder, consuming his energies, planning his days and nights. Don’t try to tell, teach, nor command him to do so, though. Pray and wait upon the Lord. Only, ONLY if your husband asks should you offer insight. Only if he asks should you explain or request a change. In one area, though, you can do much to affect a change and set your husband free to become God’s man: the realm of your own control over your husband, which is not supposed to happen. HE is God’s legitimate authority over YOU, not vice versa. Your husband’s desires or needs should plan your day, not vice versa. Your husband should choose the lifestyle you both attempt, not vice versa. Maybe your husband came from a matriarchal home, and expects you to dominate him. He may have no idea you desire him to lead. Has it been too easy to take over where your mother-in-law left off, controlling the little boy who barely guesses at the possibility of manhood? As a keeper-at-home, do you enjoy being the authority of this small kingdom, in exchange for a larger one you gave up in the business world? Do you like having your way so handily? Do you have a puppet husband? If so, repent. You have participated; you have contributed. No amount of explanation will change him, especially at first. The best thing is to submit. Send the children to him for decisions and do not argue. Ask his advice and do not argue. Do not whine. Do not bring it up again when you think he is in a better mood. Do not make that face that only you and he know is an argument, all by itself. Only when he asks is it time to explain, to confess, and to cry. Before the idea births in him is too early. Just decrease so he can increase. Stand back while he scales a height or two and catches a glimpse of the vision, first. Otherwise, you risk molding for yourself a nice, authoritative-appearing puppet. What you really want is that God would mold you a real man. I often wondered how someone like Eve or Sarai could talk someone like Adam or Abram into acting against the amazing revelations they received. (Gen. 3:6, 16:2) Or, how about Rebekah? Then, when I am honest, I know how it happened. I have seen my fingerprints on God’s clay before. It only takes a look, a sigh, a tear…a little silence correctly placed. Take your hands off the clay and let God work. God is the potter, not you. It’ll take time. It may take a lifetime. This may be your real reason for living. 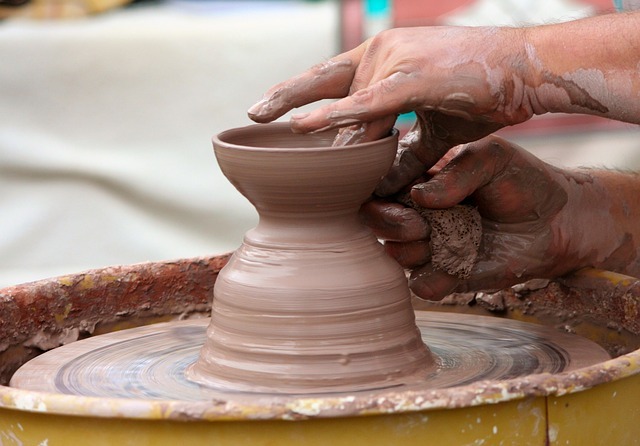 Did God choose you for the highly Spiritual work of tooling a man out of clay? Lie down, then, and be a tool ready, and in His easy reach. Ready for more? Part 6 here. I see it that way too! The English language has certainly devolved – hasn’t it? I believe it is due to the influence of television and lack of reading, mainly the great classics.